"I feel like everything I've done since being a freshman in high school has led to me sitting behind this desk right now," said Sharon Furches, Kentucky Farm Bureau's newly-elected Second Vice President. Furches replaced Fritz Giesecke, who retired from the position in December. For her, the decision to transition from her county-level board of directors’ seat to a full-time member of the Executive Committee was an easy one. After all, she has been involved with Farm Bureau nearly her entire life. Her first big Kentucky Farm Bureau experience took place back in 1987, when she and her husband, Tripp, filled out an application for the Outstanding Young Farm Family contest. Though they came in runner-up that year, they took home the number one spot in 1988 and attended their first American Farm Bureau Federation annual convention in 1989. From there, they became regular attendees at Farm Bureau conferences all across the state and country. Winning the Outstanding Young Farm Family contest spring-boarded Furches into an array of positions on various agricultural boards and committees throughout the years, including the Kentucky Farm Service Agency State Committee, State Board of Agriculture, and the Kentucky State Fair Board. At the time Furches decided to run for the Second Vice President position, she was a sitting member of the KFB Federation's Board of Directors (a position she had held since 2017). Though she was still a fairly new board member when she put her name in the hat for the Second VP position, she had actually gained more than a decade of exposure via Tripp, who had served on KFB's board for the past 12 years. "When we got to the convention, I never left," she said. "I was there the whole time running between sessions and going to meetings." She considers being selected by a group of her Kentucky Farm Bureau peers as the new Second Vice President one of the highest honors she has ever received. "I know there are big shoes to fill," she said. "My friend Fritz Giesecke has been such a positive influence for me and countless other agriculturalists through the years. He has been a tremendous asset to Farm Bureau, and I will continue to depend on his wisdom and strive to set the same example for those who will follow me as he has done for so many." Furches lives, eats, and breathes agriculture. Her enthusiasm for the industry is palpable, as she comes to the organization armed with decades of firsthand farming experience. "We need people making decisions and forming policy that understand what it's like for agriculture to be your livelihood," she said. "Farmers don't have regular paychecks. Farmers have paychecks when they sell commodities. Our members need a real farmer to represent them — someone that lives on the farm and knows what the dirt smells like, so to speak." Furches wants others in her community to know that farming is a viable industry that can sustain a family, and she hopes to use her new role to communicate that and advocate for it. Furches is unmistakably proud of her upbringing on the farm, and she is truly a product of Kentucky Farm Bureau programs, having participated in Young Farmers, LEAD, the Women's Program, and various state committee roles. 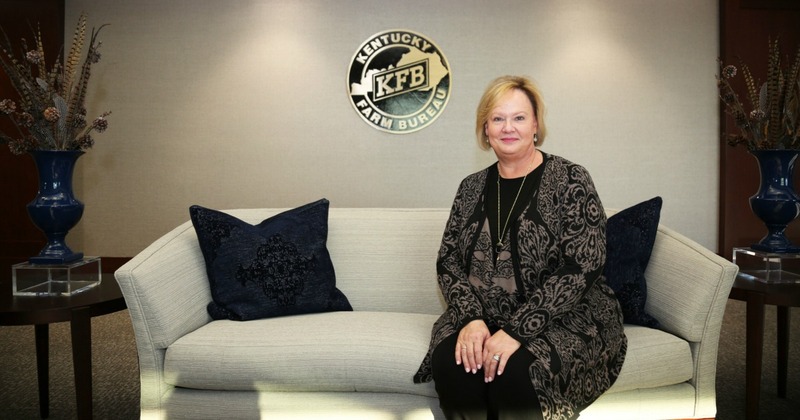 She is excited to serve as a voice for Kentucky's farmers through the engine that is KFB. "We are truly grassroots, and that is what has made Kentucky Farm Bureau 100 years strong," she said. "We form our policy and those priority issues from the dirt up." Furches was born and raised in Murray, Kentucky, an area where agriculture is — and always has been — king. She grew up working in the field with her two sisters, parents, and extended family on their grain, tobacco, and cattle farm. "It was back in the day when you still took meals to the field, and you ate on the tailgate of the truck," she said. "Back then, there weren’t all these little places to stop and eat lunch. My mom would put lunch together and we’d all go to the field and spend the day." She fondly remembers that it was the family's tobacco crop that paid for her first car. "Big ticket items always came from your work on the farm," she explained. In high school, she met her husband, who was also a farmer. "I knew if we married each other, I'd certainly be involved in farming for a long time to come," she said. The couple stuck to their roots, and they're still at it today — producing corn, soybeans, wheat, and canola on a 5,000-acre farm in Murray. She passed down her childhood on the farm to her kids, and now they're passing it onto theirs, Furches' four grandchildren. "Farming encompasses every part of what we do and how we live, but that’s a good thing for me," she said.